18 people found this useful. 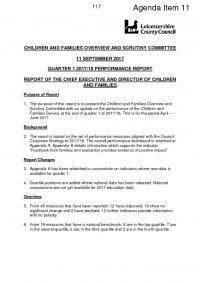 The report and associated dashboards provide an update on the performance of Leicestershire County Council's Children & Families Department. The report covers children's social care services (including child protection, children in care and care leavers), educational attainment and progression, young people's health & wellbeing, youth offending, early help services and support for Leicestershire's families. Overview Dashboards are available in Appendix A, B & C.